The ear is a surprisingly complex organ responsible for collecting and processing sounds and transmitting them to the brain for interpretation. Many take hearing for granted, but understanding the process is the key to treating hearing loss. The ear consists of three sections: the outer ear, middle ear and inner ear. Each plays an important role in hearing. The outer ear is called the auricle or pinna. It is the external portion visible to others and is responsible for collecting sound waves and funneling them into the ear canal. There, they are amplified and sent to the tympanic membrane (eardrum), causing it to vibrate. The middle ear consists of the auditory canal and tympanic membrane. When the eardrum vibrates, it stimulates movement of the ossicles, a trio of tiny bones comprised of the malleus (hammer), incus (anvil) and stapes (stirrup). The stapes attaches to the oval window, which connects the middle and inner ears. 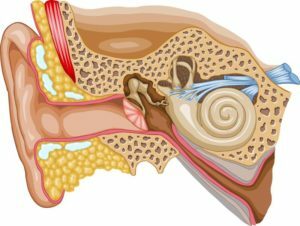 The inner ear contains the cochlea, a fluid-filled structure where vibrations transmitted from the eardrum cause hair cells to move. This movement is converted to electrical impulses that traverse the auditory nerve to the brain. There, they are interpreted as sound and the hearing process is complete. How Does Hearing Loss Occur? When the outer or middle ear are damaged, conductive hearing loss can occur. This may result from trauma or disease. Damage to the inner ear is known as sensorineural hearing loss, or nerve deafness. This occurs when the hair cells of the cochlea have been damaged, preventing electrical signals from reaching the auditory nerve. Without any information to transmit to the brain, hearing is compromised. Sensorineural hearing loss can be caused by injury, disease, aging, genetics or ototoxic medications. Patients with damage to both the inner ear and outer or middle ear have what is known as mixed hearing loss. Hear Well Center provides comprehensive hearing care for Long Beach and surrounding areas.